From cycling to the border of Netherlands, gloating over the glorious windmills, seeing people enjoy their canal boat ride and tasting the most wondrous Belgian waffles in the world, there’s more than 48 hours or the weekend to spend in Bruges, or even if you’re out for a city break in Bruges. If you are wondering what to do in Bruges and where to start: try seeing Bruges from above. The best views of Bruges is best seen from the top of the Belfry Tower (or Belfort). The Belfry is a medieval bell tower in the historical center of Bruges and is one of the city’s most prominent symbols. 366 steps is all that it takes to climb and take in the panoramic views of Bruges. For 8 euros, slightly steep but well worth it, you get to see sweeping views of the city as the towel bells chime right next to you - a complete immersion of Bruges. I always think it’s greater to see the city from above, you observe the city skyline, see what people are up to and wonder what makes this place tick. Why all the fuss about visiting The Basilica of The Holy Blood? It is said to contain a cloth with the blood of Jesus Christ. The religious gem and the holy brotherhood keeps it safe and they have a tight schedule: every morning after mass at 11:30 am and every afternoon at 2 pm, it is taken out to be the subject of intense worship, a treatment informed by the steady veneration it has received over the past eight centuries. In 2008, a dark comedy film titled ‘In Bruges’ was filmed in Bruges where Collin Farrel was well appreciated for his character as an Irish hitman who couldn’t find anything special with Bruges. From the Bruges market square to the Jerusalem church, this article perfectly sums up the famous sites of In Bruges. Over the years, the thought of “Belgian Chocolate” had come to signify my favourite guilty indulgence. Coming from an Asian country where chocolates were 90% made with highly saturated form of vegetable oil, called palm oil, I never quite liked the taste of chocolates and always squealed with delight when foreign imports made its way to my fridge, in particular the Belgian chocolate. It was my midnight indulgence and making a visit to The Chocolate Line was a must-visit to sample all the Belgian chocolates that I could to my heart’s content. By inventor, Dominique Persoone, you’ll get to see him whip artistry and perform chocolate magic on products like lipstick, massage cream and the infamous chocolate shooter, a 19th century sniffing machine, where you katapult a little of cocoa-herb mix directly into the nose. Apparently, the chocolate shooter was initially introduced on the birthday party of The Rolling Stones, and is now sold all over the world to enhance the chocolate taste perception in a very unique and weird way I must say! Weird concoctions is definitely part of the appeal at The Chocolate Line but what’s great is the attention to detail and honest ingredients where quality is proudly shown on the shop’s open concept. Even if you want to walk-in and not purchase anything and just get a whiff of the Belgian chocolate goodness, that's completely fine with Dominique. ﻿There are countless stores that will sell you overpriced waffles where you’ll need to stand in line and hustle with the crowd to get a taste of the infamous Belgian waffles which will ruin your experience. 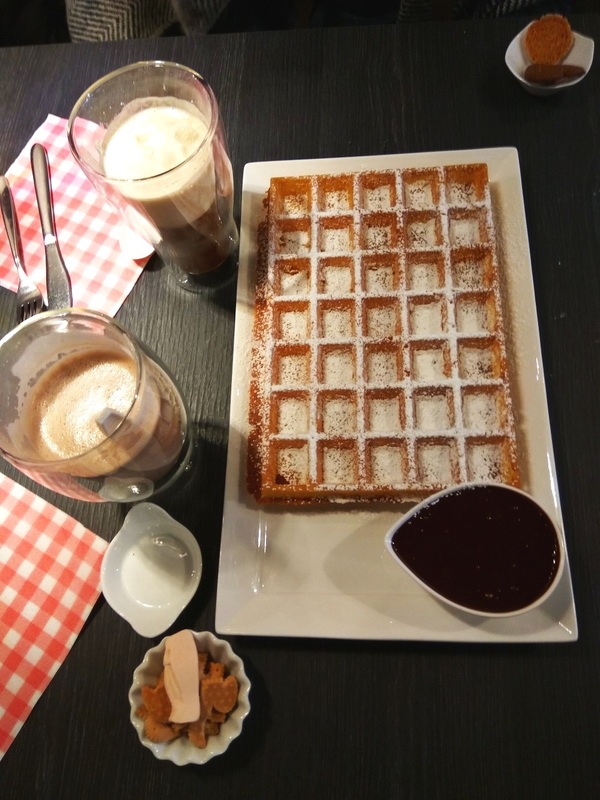 A great sit-down alternative would fit in perfectly when you try the Belgian Waffles at Lizzie’s Wafels. You get to choose from 20 different toppings - we chose whipped cream, chocolate sauce, fruits and ice-cream. and the waffles were huge, lightly dusted with sugar powder and it had a crispy and soft gooey texture to it. What’s really fun and yummy to drink is the hot chocolate - it comes in a form of tulip that slowly melts in the hot milk. It’s warm, indulgent and perfect on a cold morning or evening. What was once a monastery has now been converted into a stunning 19th-century park. Dense plantations along the edges of the park almost make one forget that the Koningin Astridpark is in the city. You’ll see winding paths with constantly changing views featuring numerous tree species like the White Willows and Silver Maples. Take a walk and chill at the bandstand as you take in the green parts of Bruges. 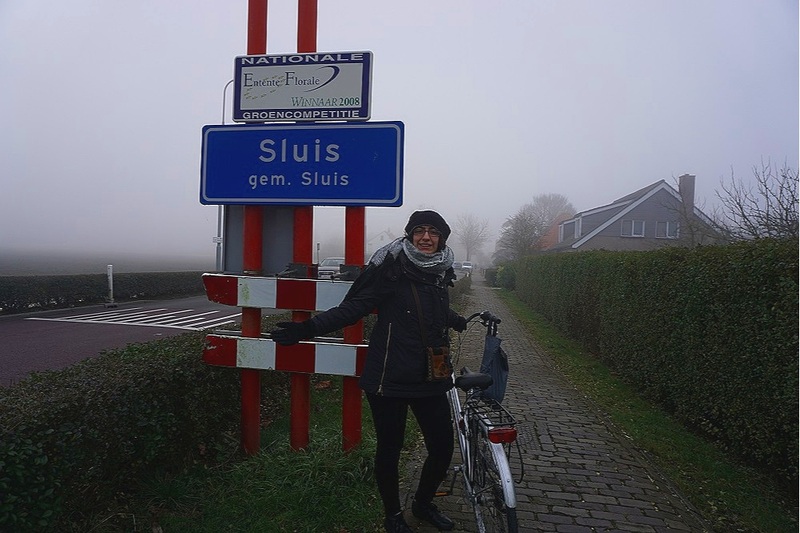 If you’re tired of packing in the calories and seeing museums, taking a bicycle ride from Bruges to the border of Netherland, Sluis will be the perfect itinerary to wrap your trip in Bruges. Many people are unaware of the beauty of the Belgium’s countryside in Damme, and the beautiful stretches of asphalt from Bruges all the way to the border of Netherlands, Sluis. The ride is about 20km and it will take you approximately 1 hour and 30 minutes to ride to Sluis. In total, it would take you 3 hours of riding. The best time would be to leave in the morning so there’s enough time to spend in Damme and Sluis. You can rent your bicycle in Bruges from couple of places but one of the cheapest places to rent your bike is from De Ketting where it is about 6 euros for the entire day. Just 6 km away from Bruges lies a postcard-perfect village with cobbled stones called Damme. The medieval town is a peaceful and somewhat miniature version of Bruges. If you’re a book lover, Damme hosts a themed book market every second Sunday of the month. But also on other days, there is a lot to do around the theme of "books". Damme is afterall a book village, so you will discover several book shops at a stone's throw of each other. Special events on literature are even hosted here as Damme is known to be the birthplace for three historical literary figures - Uylenspiegel, Nele and Lamme Goedzak. Cycling and reading sounds like the perfect experience to getaway from the crowds in Brugges. You can proudly say that you had breakfast in Belgium and lunch or an afternoon snack in Netherlands - two countries in one day with different experiences. Known for its belfry, stunning cafes and excellent shopping, the town of Sluis is seen by many as ‘Burgundian’, a Dutch term for fun-loving and almost eclectic. It is the most Flemish town in Netherlands and a popular day-trip from Bruges. The city walls, belfry and windmill in the centre of town give this nicely rebuilt place a historic touch after it was destroyed by Alied bombs in WWII. Along the way you’ll come across the the picturesque See Hoeke windmill. On the edge of town from Bruges to Damme, it is nice to pause and take a look at the windmill that was built in 1840. You can climb up the steep steps and watch as the grain sacks get lifted to the top of the mill and the working mechanism that make this particular structure fascinating. At the end of your trip, it would be a fitting way to see the last of Bruges through the waterways in a boat ride. Dubbed as ‘The Venice of the North’, the boat tour is probably one of the most popular things to do in Bruges, The best way is to catch the canal tours from Huidenvettersplein and the journey lasts 30 minutes for 10 Euros. in flemish style, our host surprised us with this welcome note. A snapshot of steve’s contest winning formula that painstakingly cost him 2 hours of his time every morning. In Bruges, Belgium, we decided to try Couchsurfing to meet interesting locals and find what makes Bruges unique from the perspectives of locals. That’s when we met Steve who gladly invited us to his home. Working with the Ministry of Economics Affairs, he had a busy schedule but despite that, he welcomed us to his house, introduced us to his family, displayed “Princess Pashmina” cards on the dinner table and showed us all the best places to see in Bruges. He told us a little bit about Belgian music and that’s when I first heard of the Belgian pop-group, Hooverphonic and their haunting tunes “Eden”. What was interesting about him is that he was also a serial contest winner. He spends 2 hours every morning trying to crack the contest code where he developed a mathematical mechanism to win every single contest (pictured above). Since then, he has travelled the world for FREE and taken his mom along. How To Get To Bruges? Getting around in Belgium is easy. Trains don't need to be booked upfront and you can take a look at this site for more information. From Brussels to Bruges takes about 1.5 hour on train and will cost you €14. If you get a chance to visit Bruges, tell me in the comments below how was your experience and what you loved most about Bruges.